Home » 2004 , E » Eep! 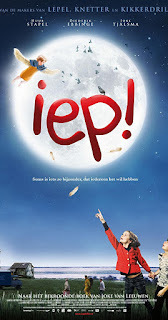 Iep! is about bird, who looks like a girl but has wings in stead of arms. Bird watcher Warre finds her under brushwood and takes her home. Warre and his wife Tine decide to keep Viegeltje and to raise her like an ordinary girl. But Viegeltje isn't an ordinary girl and she flies away. She wants to go to the South with the other birds. It becomes a long and adventurous journey.